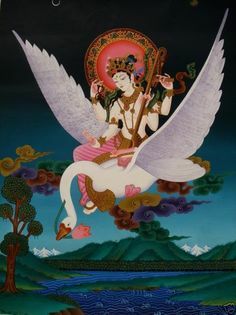 I’ve never gotten a good look at Saraswati’s face, and I’ve finally realized that I never will, because she doesn’t have one. She will wear a face and a form as needed, but she has never needed to with me. Saraswati left a piece of herself in my heart. She is immanent within me, not somewhere outside me. I don’t need to see her, so she allows herself to remain as she is – unseen. My Lady’s immanence has been quite frankly a source of frustration at times. It’s easy to forget about something that’s inside you. It’s also complicated my relationship with her. She is a part of me; I am one with her. You can’t separate me from My Lady. She has woven herself into me. How do I celebrate that? How do I relate to that? I really don’t know. All I know is that she is always here with me, even if I can’t always tell. Even if I can’t see. Posted on June 28, 2015 June 28, 2015 by Redfaery	This entry was posted in My Life with the Gods and tagged Saraswati. Bookmark the permalink.